A perfect likeness, immortalised in a timeless work of art...a perpetual commemoration of the life, beauty, and spirit of your beloved horse or pet! Comment: "Many artists do horses, but you see them from the inside out. You capture the vary soul of these animals". 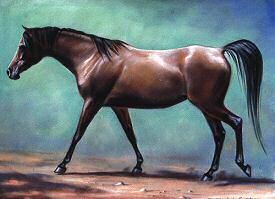 Thank you for your interest in a portrait commission of your horse. All portraits are painted in life-like fine detail, similar to the works of old Master artists of the nineteenth century. When I create a portrait of a horse, I work with photos from the client or professional photographs (if the client owns the copyright or has written permission from the copyright owner for the use of the photos for the creation of a portrait). I prefer to be shown all the photos that you have so there will be plenty to choose from in selecting a composition. It will be helpful to write comments on the back of each photo. Though there may be many photos, basically, I work from one main enlarged photo (8x10 preferred). If you will be taking your own pictures, natural sunlight works best for capturing the true color of the horse, plus highlights and shadows. I prefer not to directly work from a photo taken with a flash. However, if you no longer have the horse and that is the only photo available, I may make an exception in such a case. I would have to see the photo to know whether it could be used for reference. I do not accept computer print outs on regular computer paper as a substitute for photos, because they are not clear enough and often have distortions. If you have an exceptional printer, that may possibly be acceptable. I would need to see the photos to know for sure. In addition, if possible I prefer a video accompanying the photos. The videos can be very helpful for capturing the beauty, personality and spirit of your horse. Videos often reveal what photos may not, especially when the animal is free to play and express itself in movement. The exception would be an equestrian portrait. In that case the video should reveal the horse tacked and being ridden. All reference material will be returned after work is completed. I use only the finest quality professional artist materials. which include water soluble oils and perfectly primed archival panels, smooth for fine detail. If you would like the colors in the portrait to complement your interior decor, please state the colors in the room. You may send a photo of the room if the color is accurate. It would be very helpful if you can send samples of the colors, such as clippings from a catalog or magazine that match the same color. For more information on commissioning art, Click Here. ALWAYS A PERFECT LIKENESS...COMPLETE SATISFACTION GUARANTEED!!! 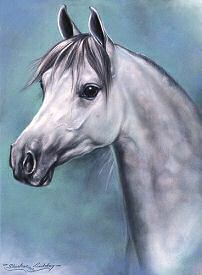 HEAD PORTRAITS may be created in any position as long as it is complimentary to the horse. I generally like to depict the subject down to the chest and shoulders. If you wish to include more of the body, add 10% to the basic price. FULL BODY PORTRAITS are limited from sizes 16x20 to 24x30. The subject may be standing or in action. No limits for positions, as long as it is complimentary to the subject. 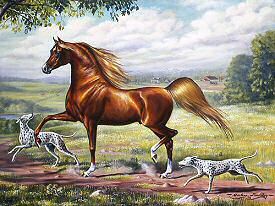 I AM PROFICIENT WITH ALL BREEDS OF HORSES AND OTHER ANIMALS. Prices are the same for Full Body and Head Portraits. For more information on commissioning art, Click Here. For a second subject, add 70% over the base oil portrait price, (or if it is a very young foal add only 30%, older foals 40-50% depending on how many months old). 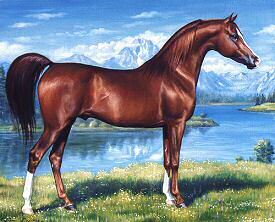 An individual portrait of a foal is the same price as for a mature horse. For more than two subjects, please inquire for a price quote. For more information on commissioning art, Click Here. Full body portrait, add 20% to the base price. Please include good clear photos of dog. For more information on commissioning art, Click Here. The sizes and prices are the same as for horses. See pricelist above. For more information on commissioning art, Click Here. The basic background for a HEAD PORTRAIT is a soft mistical effect, a beautiful sky with clouds, or if desired, a solid black background. For a sky background that includes landscape at the bottom, add an additional 10% over the base oil head portrait price. The basic background for a FULL BODY PORTRAIT is a soft mistical background. Portraits with landscape backgrounds have three categories to choose from: SIMPLE LANDSCAPE (Very simple country scene, woodland, desert with sand dunes, or simple seascape) - add 20 %. MORE COMPLEX (involved mountain scene, seascape, or landscape with buildings in the distance, horse show, race track, or etc - add 40% ; COMPLEX WITH BUILDING STRUCTURES (such aa Arabic, Egyptian or Spanish style) - add 60%. For more information on commissioning art, Click Here. Add 100% to the basic price for a Full Body Portrait. 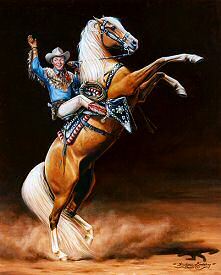 If there is a small amount of silver trim on the tack, add an additional 5% to the total cost of portrait. For a very elaborate parade outfit covered with silver, add 50% to the total cost. For more information on commissioning art, Click Here. Photos needed: A good clear photo enlargement of horse and rider (8x10 preferred). If your favorite photo is in black & white, please include additional photos in color that reveal the true color of the subject. In addition, it would be very helpful to provide other photos of the rider so I can clearly see their facial features. If possible, please take a close up picture of their face in same position and same lighting. This will be of great help for capturing a detailed true likeness of the person. The photo would be best if taken off the horse and standing. However, if you have a zoom lens on your camera, it would be preferable to take the picture of the person on the horse. Stand back as if to take in the horse, but instead zoom in on the person, taking some close-up shots. In addition it would be helpful to take a close-up of hands in the same position as the main favorite photo. This type of portrait includes a horse, driver and buggy of any kind. For the addition of the buggy, Add 50% to price of Equestrian Portrait. Would be most impressive with a landscape background. See Portrait Backgrounds. For more information on commissioning art, Click Here. Photo requirements: A good clear photo enlargement. In addition, and a good close-up of driver's face would be very helpful. See "Equestrian Portrait" above for more details on taking pictures. This is a Head Study with one or two smaller full body depictions of the subject in action of which have the resemblance of a dream. This type of portrait can be very artistic! For one Full Body image with a Head Study, add 30%; two Full Body images, add 40% to the price of a Basic Head Study. For more information on commissioning art, Click Here. Pencil portraits have their own special quality in black & white. Each portrait is rendered on smooth, heavy (acid-free) Bristol paper, using professional graphite pencils. All pencil portraits are rendered in fine realistic detail with soft shading. Allow about 3-4 weeks depending on previous commissions and other work. Photo requirements are the same, except color photos are not necessary but perfectly fine to use. The following listing is for a HEAD STUDY or FULL BODY of one horse that is standing or in action. For a second subject add 70% (or if it is a young foal 30%). For more than two subjects, please inquire for a price quote. For more information on commissioning art, Click Here. 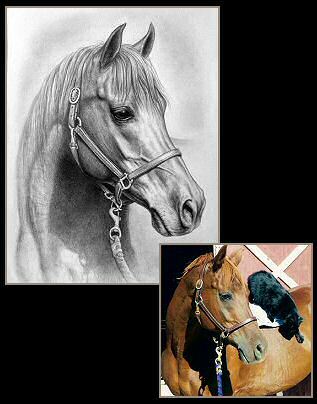 "My client was very pleased with this pencil portrait of her horse (shown at right) and felt it was an excellent likeness! She desired the ears to appear alert in the portrait, and I enlarged the eyes just a bit, being some photo distortion caused the eyes in the photo to appear smaller then they actually were, being the horse is a purebred Arabian."